HAGIBIS is moving E rapidly. At 8 am, HAGIBIS was centred about 620 km (340 NM) S of Tokyo. HAGIBIS is the 52nd name in the tropical cyclone name list. It was contributed by the Philippines, meaning fast. This name was used in 2002 and 2007. HAGIBIS is now situated north of the subtropical ridge, and the westerlies is expected to push HAGIBIS quickly to the east. HAGIBIS has started extratropical transition, and this process should be completed in less than 12 hours. No threat to Hong Kong is expected within the next 72 hours. This is the final bulletin on HAGIBIS. HAGIBIS re-entered open seas last night and regained structure as moisture is fed into the storm again. Wind field analysis shows gale force winds near HAGIBIS's centre. Bulletins are thus reissued for this system. At 2 pm, HAGIBIS was centred about 310 km (170 NM) NW of Okinawa. HAGIBIS is now situated north of the subtropical ridge, and the westerlies is expected to push HAGIBIS quickly to the east or ENE. HAGIBIS weakened while on land. However it stayed inland for shorter duration than expected, and its structure improved quickly after entering East China Sea. The storm is subjected to rather high vertical wind shear with low sea temperatures (below 26 degrees). It is expected to transform into an extratropical cyclone within 24 hours. 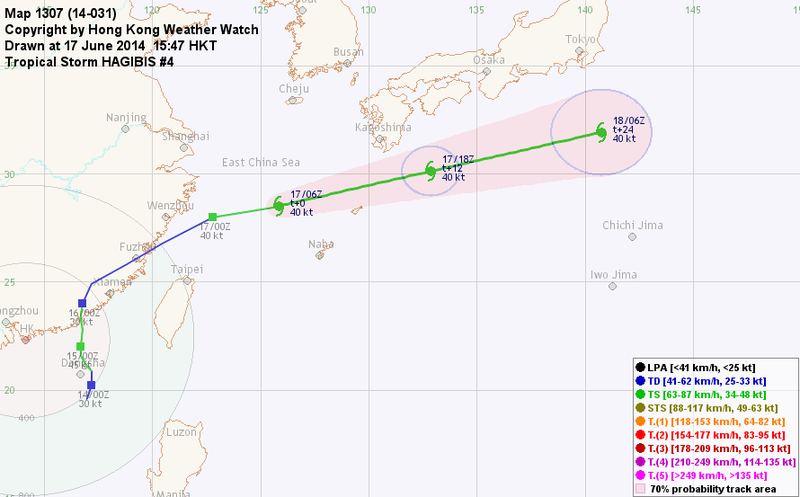 HAGIBIS made landfall near Shantou last night and has weakened into a tropical depression. 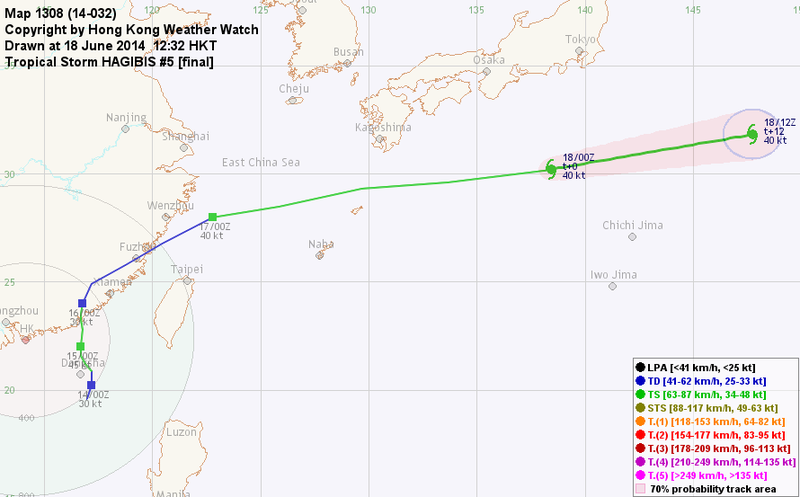 At 8 am, HAGIBIS was centred about 330 km (180 NM) NE of Hong Kong. HAGIBIS will move N to NNE along the western periphery of the subtropical ridge. HAGIBIS is losing convections rapidly and will dissipate soon. No significant threat to Hong Kong is expected within the next 72 hours. HAGIBIS intensified and continued to move north with some westward motion. In Hong Kong, the Standby Signal was in force from 5:40 pm yesterday to 1:20 pm today. At 2 pm, HAGIBIS was centred about 280 km (150 NM) ENE of Hong Kong. HAGIBIS is expected to make landfall near Shantou soon, and will move N to NNE along the western periphery of the subtropical ridge. HAGIBIS maintains a symmetric circulation. The storm will weaken as it makes landfall, and is expected to dissipate by t+36. 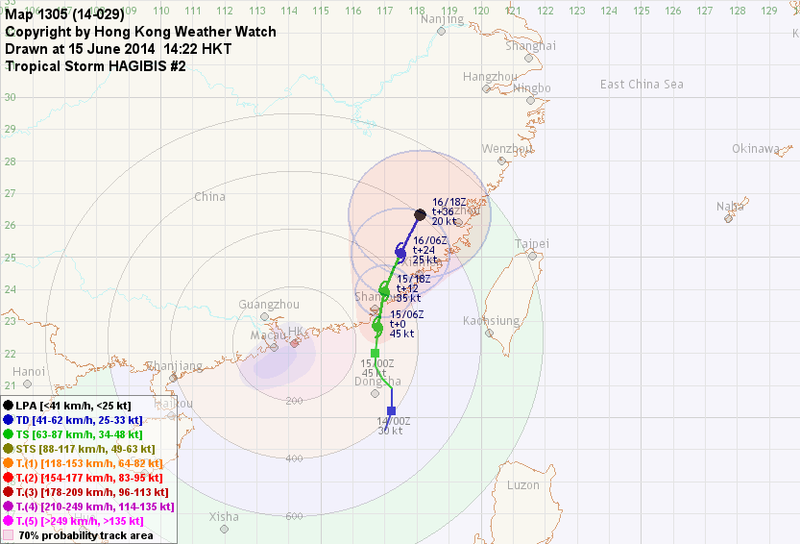 Winds in Hong Kong will back to southwest tonight. There will be some showers, and swells continue to be a danger over open seas. As HAGIBIS makes landfall, its effects on the territory will diminish over the next two days. Tropical disturbance 95W over the South China Sea intensified into a tropical depression today. It later strengthened into a tropical storm (07W) and was named HAGIBIS. 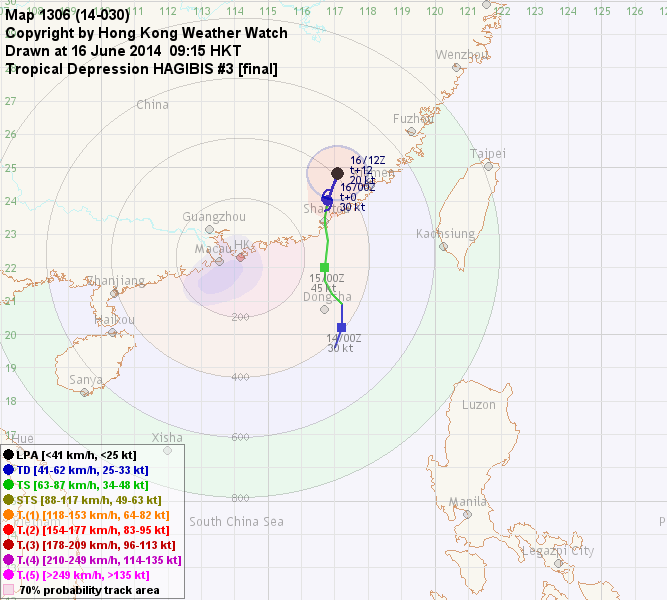 At 2 pm, HAGIBIS was centred about 350 km (190 NM) ESE of Hong Kong. HAGIBIS is situated at the western periphery of a broad subtropical ridge over the northwest Pacific, and is expected to move N to NNE throughout the forecast period, making landfall near the Guangdong-Fujian border tomorrow or early Monday. HAGIBIS is collecting convections gradually. It is expected to intensify in generally good environmental conditions within the next 24 hours. As it nears shore, development will become more restricted and it will pick up a weakening trend upon landfall. 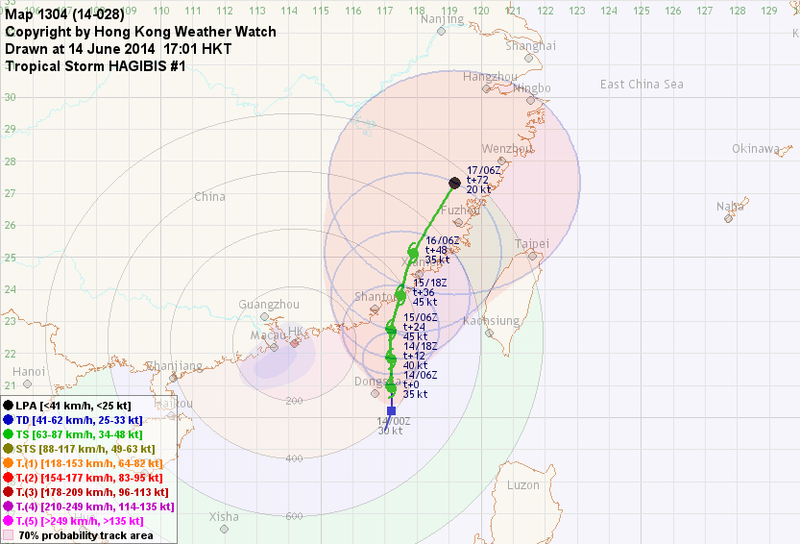 HAGIBIS is expected to maintain considerable distance from Hong Kong throughout the forecast period. As it is highly likely to make landfall east of the territory, its effects should be limited. Winds are expected to back from north to southwest over the next two days with some showers. There will be swells over the seas. 2) "Low" = Probability from 5 to 20 per cent; "Medium" = 20 to 50%; "High" = 50 to 80%; "V High" = 80% or above.